Dynamic Display is available for Rhinoceros 4, 5 and 6. This command allows you to check for interferences within a model that contains closed polysurfaces or closed meshes by comparing all the objects each against one another. This command use all your CPU cores so if your CPU have time you will be able to orbit your view while interferences are computed even run a new command or hide a layer. Every time a command ends, interferences will be computed again. This command runs only in shaded display modes. This is a slower but more flexible version of ClippingPlane command. Allows use any closed polysurface or mesh as clipping object. If clipping objects are created while history is enabled in the editor, these can be modified later and section will be updated automatically. This command defines a plane and enables a display conduit that redraws symmetrically all the geometry along that plane. Could be used to model symmetrical objects like a yacht hull. Here you can download the installer for the latest version of Dynamic Display. Please check the requirements for your platform. Fixed a bug that makes ddInterfere and ddMirror commands didn’t work when there were no clipping objects in the document. Improved Rhino display performance when no clipping object is enabled. Fixed the 32 bits installer, it used to fail when Rhino 4.0 was not installed. Fixed a bug in ddClippingObject command that makes geometry disappear when is far from origin. Solved an installer problem that makes it leave some registry keys on the computer even when uninstalled. Improved the way Dynamic Display handle disjoint meshes for better results. Added support for Technical display mode in Rhino 5.0. Fixed a bug into the update system that makes it fail on Rhino 5.0 64 bits. Fixed a bug in Rhino 5.0 64bits that makes culled objects are picked. 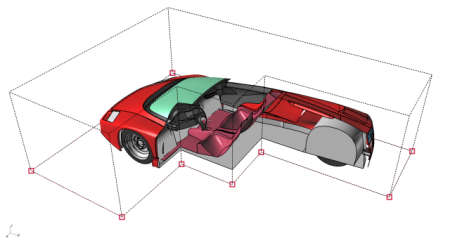 Compatibility with Rhino 5.0.20110331 build. Fixed a bug that hungs ddInterfere command. Setup files are now electronically signed. Installer Now check if the right Rhino version is installed. Fixed a bug into the auto updater mechanism. Fixed a bug in ddClippingObject when an object is completly inside another. Improved ddClippingObject to be more Multi-Core. Improved ddInterfere command with interferences listing. Can I share Dynamic Display installer? Yes, you can, and we’ll be very grateful. We want as much people as possible to use Dynamic Display. Does Dynamic Display modify the document? No, is doesn’t. Dynamic Display is an analysis plug-in, and it will not modify any document you may open. Would it be possible for the ClippingObject to clip the Curves as well? No. Currently Dynamic Display only works with meshable objects like surfaces, polysurfaces and meshes. Would it be possible to render Dynamic Display results? Currently Dynamic Display it’s only a display trick. If you want to obtain clipped meshes use ddExtractMesh command. Mirror plane has no representation so sometimes is difficult to figure out where it is. Currently objects into blocks are not clipped.